Chris Wolff never imagined he’d be here. In fact, he never thought he’d see the outside of his C-130 troop transport plane. “I had accepted it,” he said. “I was going to die in the sky over Afghanistan.” But somehow, against all odds, he survived. Even though an RPG (rocket-propelled grenade) penetrated the aircraft’s engine, the pilot “was able to limp the aircraft back to base.” Ironically, it wasn’t this harrowing experience but a virus vaccine that almost killed him. His spinal cord became infected, his white blood cell count skyrocketed, and within a matter of days doctors were telling him he would never walk, breathe, or eat on his own again. A month before that he was the picture of health, and now his life was unrecognizable to him. Jake Schick is a third generation Marine. Everything about him “epitomizes service and sacrifice.” In 2004, a triple-stacked tank mine detonated below his vehicle in the Al Anbar Province of Iraq. 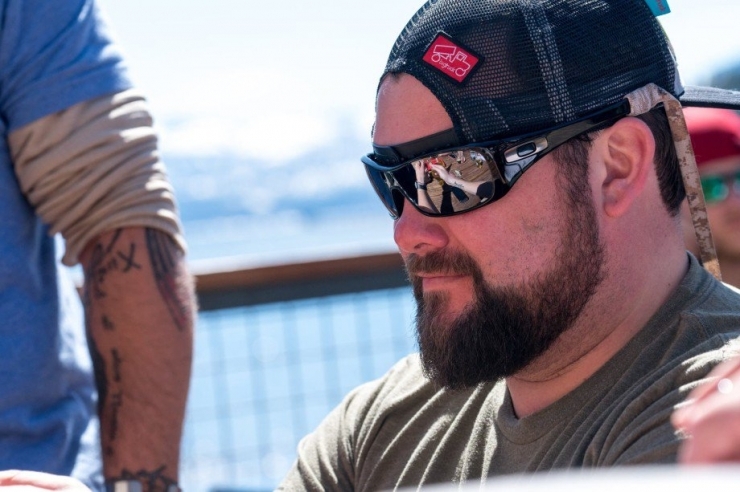 Jake suffered compound fractures in his left leg and arm; he endured burns, loss of skin, ligament, and bone, partial loss of his left hand and arm, amputation below the knee of his right leg, traumatic brain injury and PTSD. At the moment many people would give up and give in… Jake set to work. To date, Jake has undergone 46 operations, 23 blood transfusions, and countless hours of rehabilitation. In 2014, Jake appeared in the film American Sniper. And in 2015, he met a group of people who were going to change his life. 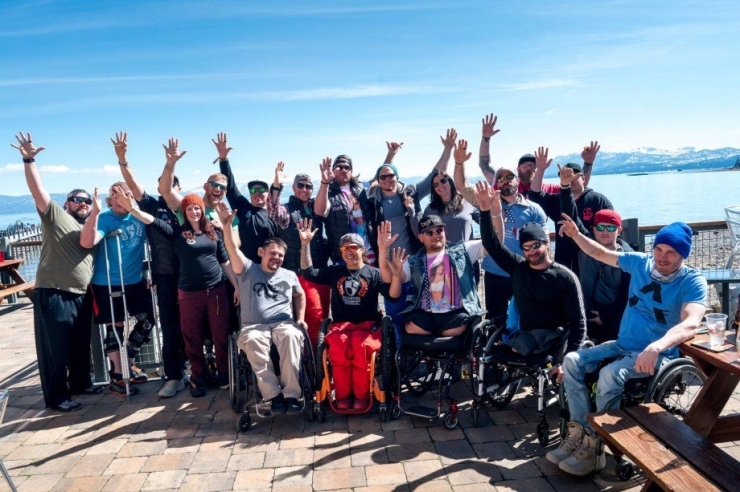 The High Fives Foundation is a non-profit that supports the dream of mountain action sports athletes who suffer life-altering injuries. 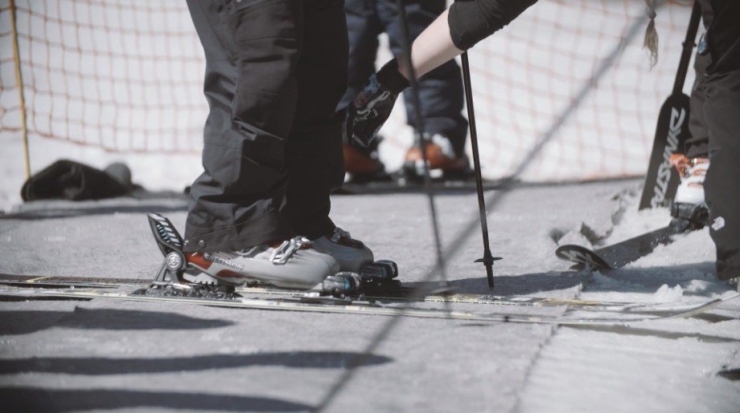 HFF raises injury-prevention awareness while providing the resources necessary to get athletes back on the mountain. 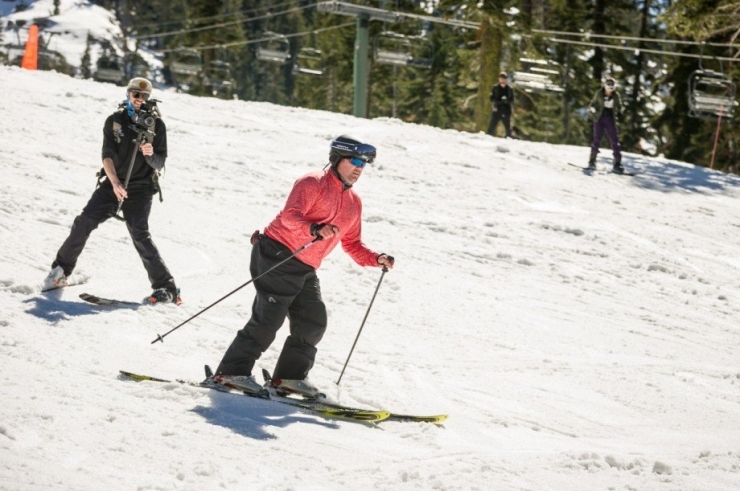 They provide rehabilitation and training at their Adaptive Training Facility in Dallas and adaptive ski lessons in Lake Tahoe. They were growing at a rate that no one could have expected. Then, they met Jake Schick. Jake, far left, is “easily one of the most amazing people I’ve ever met in my life,” Roy told us, founder of the High Fives Non-Profit. Coming from Roy, that’s quite a compliment. 10 years ago he suffered a devastating spinal cord injury and became paralyzed from the waist down. In a moment, his lifelong dream of becoming a world class professional skier was shattered, and he had to relearn everything from the ground up. But after lots of hard work and a ton of support, he was back in skis in March 2008. “What you put into your recovery,” Roy said, “I believe you’ll get in return.” In fact, he believed it so strongly – he started a non-profit based on that idea. Jake met the HFF guys and was inspired by their work. 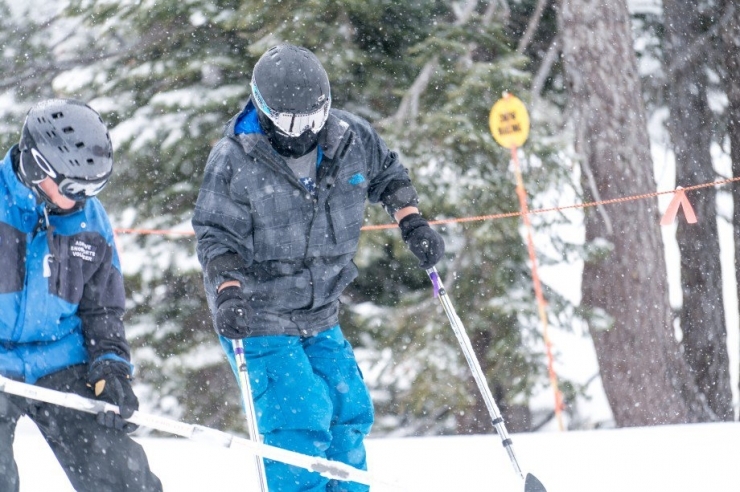 When asked if he wanted to participate in their training and ski lessons, he was hesitant. “At first I didn’t want to push it. If something happens to this left leg I might lose it.” But in the end, he realized if he’s not challenging himself, he’s not really living. So last year, he flew out to Tahoe for the adventure of a lifetime. That was all it took. Jake’s experience on the mountain catalyzed High Fives’ newest program: Military to the Mountains. Their goal is to serve as a platform for U.S. veterans to tell their stories, embrace goal-setting and athleticism, and enjoy life and all of it’s challenges. So that’s exactly what they did. This year Jake returned to the mountain, with 9 more veterans. Here’s a picture from their first day. 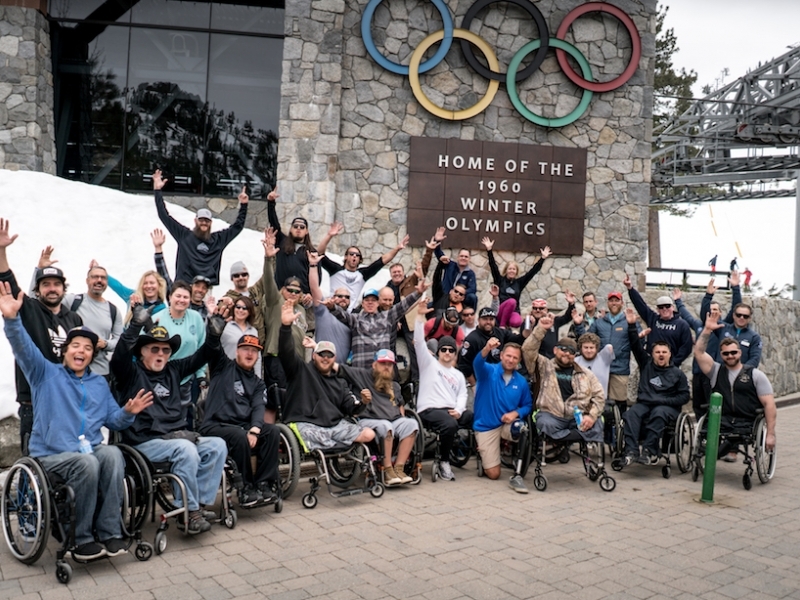 The 9-week program at the Adaptive Training Facility gets vets in the shape they need to be in to maximize their enjoyment (and safety) on the mountain. The training is grueling. The days are long, the work is hard, and at some point, it has every veteran questioning if they should quit. But they never do. And because they don’t, it makes the victory of summiting the mountain that much sweeter. Because they know it took them much more than most people to get there, and that’s something to be proud of. By the end of the week they were pros! 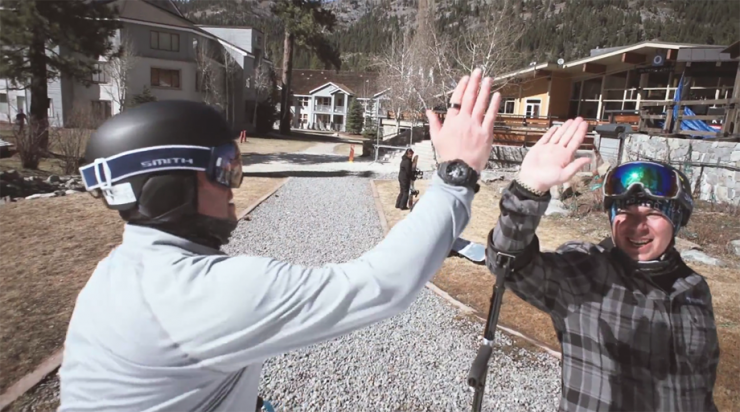 Here is the High Fives staff with Jason Abraham, a local Tahoe skier who suffered an skiing injury last April that rendered him quadriplegic. 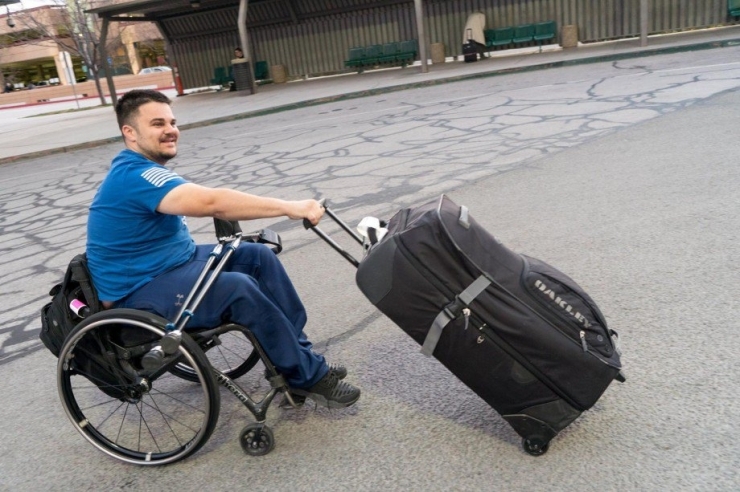 After his trip to Tahoe, Jake was “open, smiling… he had a new lease on life.” And seeing a true transformation like that can have a profound impact on the people who witness it. Certainly for the High Fives staff, because it was the moment that sparked, for them, the inception of a program they would call Military to the Mountain. But also to the people who watched him ski down the mountain for the first time since his 46 surgeries. The people who watched someone who never thought he’d do something again, defy all the odds and do it again. And lastly, to the people who read this. Who read the story of Jake, Chris, and the veterans who decided that, after injury, there was still life to be lived. 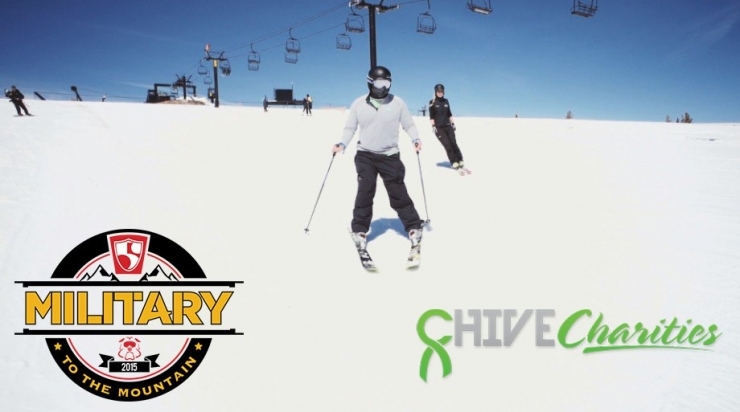 Next year Chive Charities is making it possible for 10 veterans to experience Military to the Mountain. 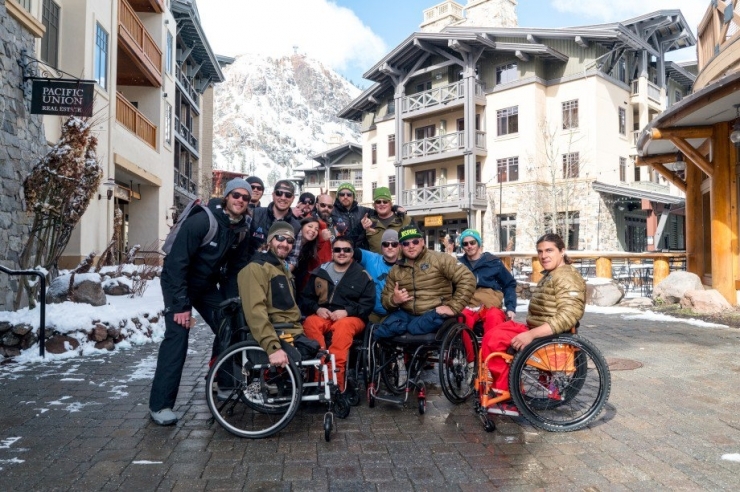 It costs $6,400 for each veteran to train for 9 weeks at the Adaptive Facility in Dallas, for their adaptive ski instruction with all lessons, equipment, and transportation, and to cover all their meals. So, we are proud to announce a grant of $64,000 to give 10 more veterans the time of their lives, to give them the second chance they deserve. 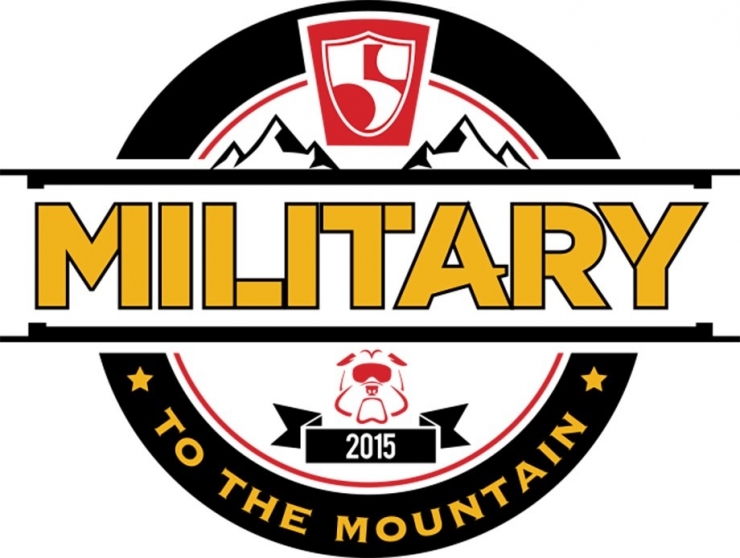 Military to the Mountain is a brand-new program. 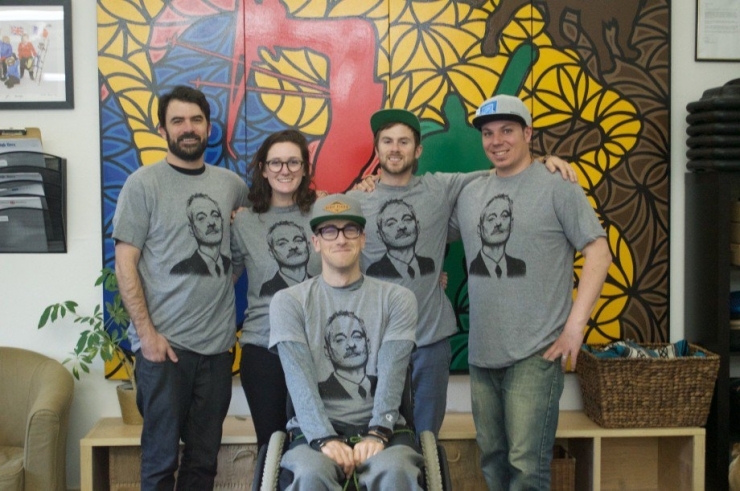 Some might call them the underdog, and Chive Charities knows something about that. After all, we’ve built a movement around championing those who are defying the odds. Sometimes, things don’t have to be done on a grand scale to make a real difference. This program lifts veterans out of the darkness of PTSD, of adjusting to life with an injury, and giving them an opportunity. It gives them a reason. If Military to the Mountain helps one person, it’s worth it. And thanks to Chive Charities, next year it’s helping 10. The program is the result of one experience with a hero named Jake Schick. The entire program was founded because Jake’s life improved after his trip to Tahoe. 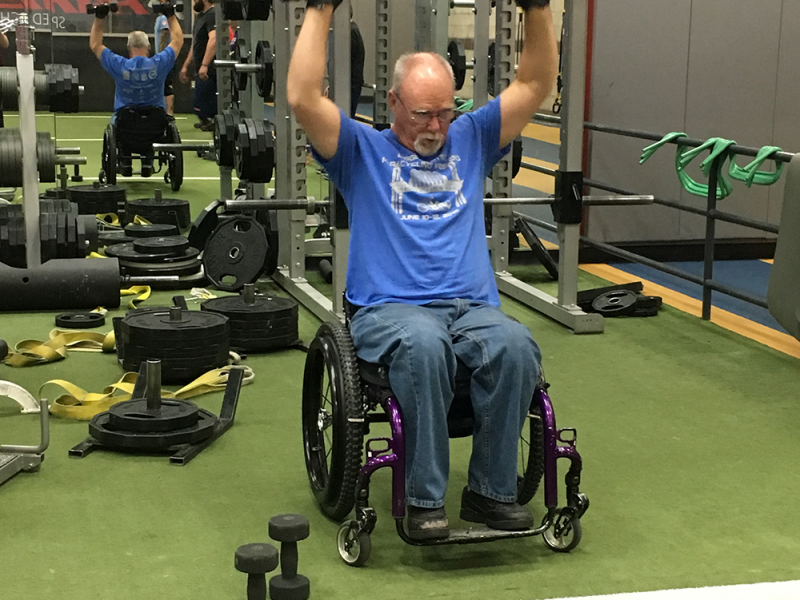 Typically, veterans or athletes who have recently suffered a life-changing injury find physical therapy draining, exhausting… both physically and mentally. But when they work for two months to achieve a specific goal: to ski down one of the most beautiful mountains in the world, it becomes easier. The urgency to work, to better yourself, is palpable. And if veterans and athletes share one thing, it’s tenacity. Neither one will ever give up. And we know something about that too. To learn more about how to apply for the 2017 Military to the Mountains program you can email info@highfivesfoundation.com. 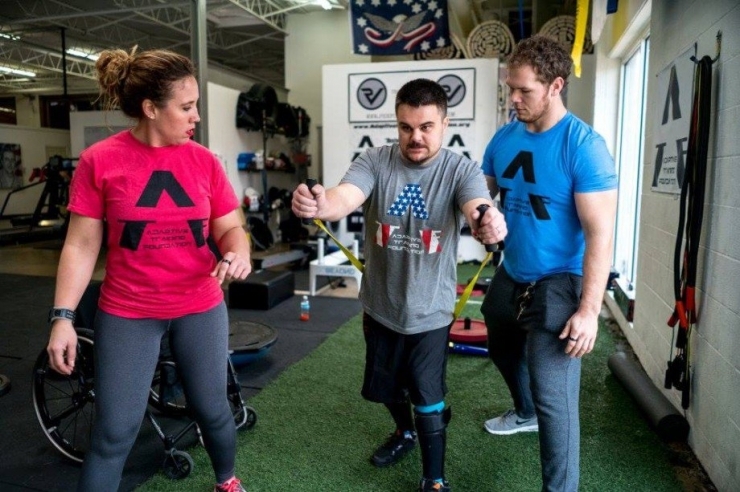 You must be a veteran of the U.S. Military living with a life-altering injury, and applicants must live near the Dallas, Texas area to participate in the 9-week training program. People are the most important part of what we do. We help people. We aim to make a real difference in real lives. But we do that with money that doesn’t come from nameless sources or large corporations, we do it with money from people who realize they have the ability to make a difference. And they do it with the knowledge that one day, if the tables were ever turned, others would do the same for them. These people are called the Chive Charities Members, and they are the lifeblood of Chive Charities. They are what makes us special, they give us the means, and the motivation, to keep making a difference. Join their ranks and become a member today.